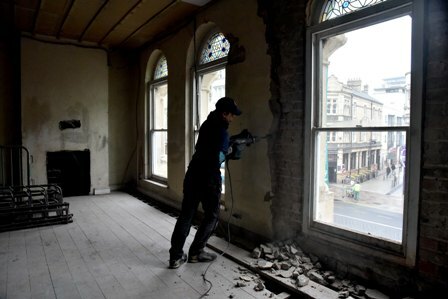 Builders working on the refurbishment of The Philharmonic have uncovered original features which were buried under plasterboard and floorboards after the building suffered decades of patching up. A hidden lane which ran between the former Philharmonic Hotel and the Philharmonic Hall was discovered behind a bar at the venue. Developers first thought it was a series of fireplaces, until further investigation unearthed a lane running the entire width of the building. 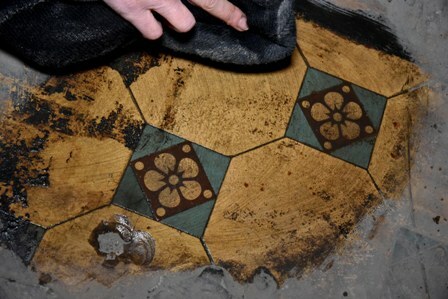 An original tiled floor was also found in the basement, the former Lloyds nightclub, which had been hidden under a wooden floor fitted years before. The lease for the grade II listed building has been bought by Croeso Pubs Ltd, an independent bar company run by Craig Davies and Simon Little. Croeso Pubs already run two successful independent city centre venues,Brewhouse, the live music venue situated in the Brewery Quarter, and Retro, home of the nineties vibe on Mill Lane, and is proud to add The Philharmonic to their portfolio. The opening of The Philharmonic was postponed to safeguard the future of the building as a lot of structural work had to be carried out by landlord G Capital before Croeso Pub’s builders could start work on the fit out. Around £750,000 will be spent on remodelling the building and due to its complicated structure and layout it has taken longer than expected to start work. The Philharmonic is now scheduled to open at the end of May. Director Simon Little explained: “We have incorporated the lane into our design for The Philly and want to open up the building as much as possible to let as much natural light flood the venue. You will be able to see from the front of the building on St Mary’s Street right through to the back and Great Western Lane. Co-Director Craig Davies added: “It is such a beautiful building and although we were disappointed that we had to put the opening back, we didn’t want to open when it wasn’t ready. We are doing this right and want to ensure that it is here for generations to come, to do that we have had to take the building right back to its bare structure. 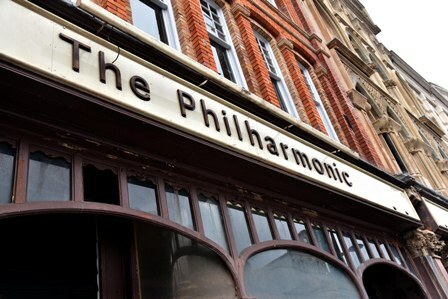 The Philharmonic will be open seven days a week from 9am until 4am and will serve food all day. The management team at The Philharmonic is appealing to the public’s help by sharing memories, pictures and anecdotes of The Philly. As part of the creative fit out of the venue they’d like to celebrate that fact by using photos from different decades to adorn the walls of the venue when it is finished. Members of the public can share their Philly photos by posting them on The Philharmonic Facebook page https://www.facebook.com/thephilharmoniccdmf or on Twitter using the hashtag #Phillyphotos.